Ninth sign of the zodiac. The sun passes through this constellation from late December to late January, so it is best viewed in the nights of summer time. This constellation is certainly worth random scanning with low power scopes as well as intense investigations of the single objects. Not only there are lots of rich star fields towards the galactic center, there a numerous clusters and nebulae. In the center of this constellation lies the conspicious asterism the Milk Dipper (it seems that it is sometimes called "The Teapot"). It lies in the beautiful star clouds of the southern Milky Way. Some of stars have common names. See here a list of them. The binary zeta Sgr (b 51) cannot be resolved by amateur scopes. Just one star of 2.6 mag can be seen. Largest telescopes are required to split this close double of an A2 giant and an A4 subgiant. The two stars revolve each other in 21 years. 21 Sgr is a test for a telescope with an aperture of 80 mm. It might need an aperture of at least 100 mm to split 21 Sgr into its components. The interesting orange-green pair has magnitudes of 5.0 and 8.3. Some Cepheid variable stars can be found in this constellation: W Sgr is a supergiant which brightness fluctuates every 7 days and 14 hours between 4.4 mag and 5.0 mag. The supergiant (spectraltype G1.5Ib) U Sgr lies close to center of M25. The brightness of this Cepheid varies from 6.3 mag to 7.1 mag every 6day and 18 hours. X Sgr is a F2 bright giant. Its brightness varies from 4.3 mag to 4.9 mag every 7 days. To the naked eye beta Sgr seems to be a double star. The both stars, a B9 main sequence star of 4,01 mag and a F2 giant of 4.29 mag, are not a real binary (no physicale relation). Viewed through a small scope the more northerly star, beta1 Sgr shows a 7th mag companion. The Sagittarius Star Cloud or Delle Caustiche, M 24, is not a real deep sky object, but a large star field; it is a part of our Milky Way. The naked eye it appears as a foggy patch, larger scopes reveal a breathtaking star cloud. The famous Lagoon Nebula, M8, is probably the best of the diffuse nebula and one of the finest in the sky. As it is of 6th mag the naked eye can see it in a dark night. Binoculars and small telescopes reveal an open cluster within that nebula, NGC 6530. Viewed with scopes with an aperture of at least 75 mm the dark lane of dust, which gave the name to the nebula, is revealed. The color and the internal structures can only seen on photographs. The diffuse nebula M 17 has lots of names. It is known as Omega, Swan, Horseshoe or Lobster Nebula. In small scopes the nebula appears like the tail of a comet. At one side some stars are sprinkling. They build a mini cluster and belong to the nebula. Larger telescopes reveal a looped shape. The last of the three diffuse nebulae, M20, called Trifid Nebula, got its name from the three dust lanes, which divide the nebula. This structure can only be seen with large telescopes. Small scopes just show the bright stars in the heart of the nebula. The planetary nebula NGC6818 shows an irregular oval shape. The open star cluster M 18 appears loose for the 20 cluster members a scattered over a region of 0.2 degrees in the sky. Therefore its best viewed with binoculars or small scopes. M 23 is an excellant object for binoculars. The open cluster nearly covers 0.5 degrees of the sky. With small scopes some the about 100 cluster members can be resolved. About 50 stars of 6th mag and fainter build the cluster M 25. It is a good object for binoculars. NGC 6530 is a binocular cluster of about 25 stars of 7th mag and fainter. It is located in the Lagoon Nebula. The globular cluster M22 might be the first globular cluster discovered. As it is even brighter as the famous Hercules Globular Cluster, M13, it can be seen with the naked eye. It should be noted that this cluster lies less that 1 degree of the ecliptic; therefore conjunctions with planets can be observed quite frequently. Close to zeta Sgr the globular M54 is located. Although it is bright smaller binoculars may overlook it because it is so dense that it looks like a star. In 1994 the discovery was made that this cluster does not belong to our galaxy but to the Sagittarius Dwarf Elliptical Galaxy. A large, but loose globular cluster is M55. It can be viewed with binoculars. For details about M28, M69, M70 and M75 (as well as for all other Messier objects) please take a look at the Messier database. At the very edge of Sagittarius, at the border to Ophiuchus and Scorpius lies the center of our galaxy. It lies about 30000 lightyears distant. 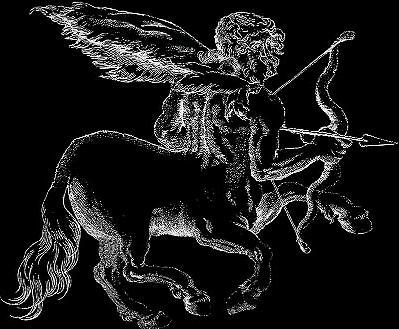 From June, 8th, till June 16th, the Sagittariids are active. This shower was detected 1957/8 during radio-echo surveys. The maximum occurs around June, 10th and 11th. The average radiant is DECL=-34 deg and RA=304 deg. The Phi Sagittariids can be observed from June, 1st, to July, 15th. It shows a weak maximum on June, 18th. This shower seems to renamed recently to Scorpiids-Sagittariids. The Capricornids-Sagittariids are a daylight shower and can be observed from Mid-January to February.